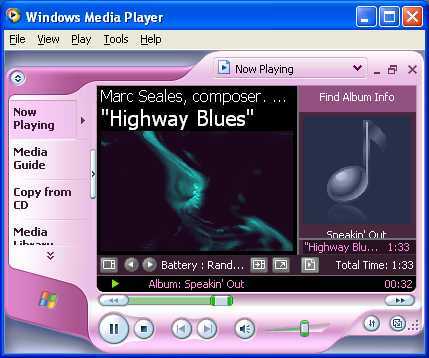 At first start Windows Media Player then select Tools menu and click Options, select Privacy tab and click Clear History. Click OK button. Result: Clear your recent media file ( mp3, mpeg, mpg, avi, wmv, dvr-ms ) list in file menu. Result Tested: Windows Media Player 9 Series. 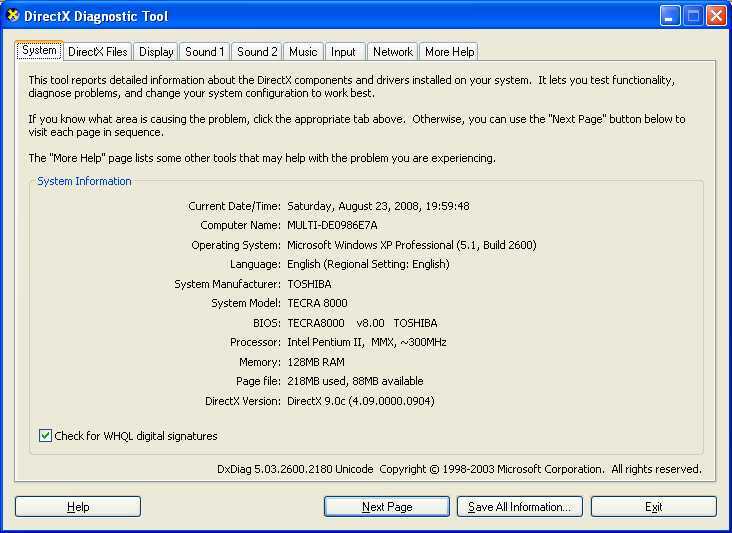 This tool reports detailed Information about the DirectX components and drivers installed on your system. It lets you test functionally, diagnose problems, and change your system configuration to work best. Start your computer with Administrative user. Click your Start menu and click Run… Type dxdiag.exe and Press Enter Key. Maybe a windows open your computer. DirectX Files, Display, Sound 1, Sound 2, Music, Input, Network etc. option in this windows. Last click Exit and close this windows. 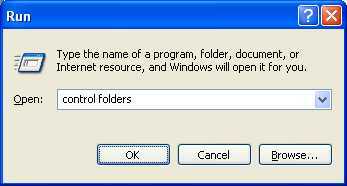 If you execute this command then open the Folders Options windows. Click your Start menu and click Run… Type control folders and Press Enter Key. Maybe Folders Options windows open your computer. If not Folder Options windows open in your computer then try to start computer windows operating system with safe mode. 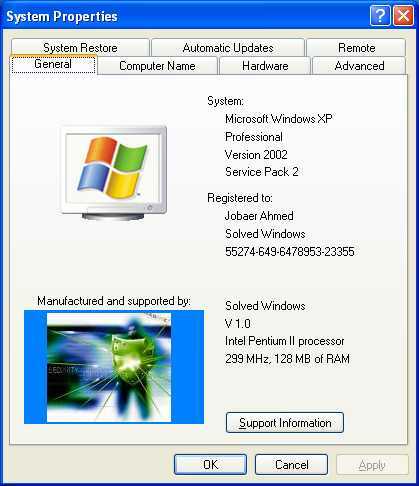 If you add a company logo & information in System Properties windows, your need create two files. One is oemlogo.bmp image file & Second is oeminfo.ini file. Line2=" For Free Windows Virus Solution, Tips & News:"
Line4=" If your have any experience in virus solution, important windows "
Line5=" related tips or latest computer related news "
Line6=" please e-mail to jobaer2002@gmail.com with screen print." Now close all windows and press F5 function key for refresh your windows. Result: Expand the Desktop and right click in My Computer icon then Select Properties. Maybe open System Properties windows with your company logo & click Support Information button for view company information. If you can open hidden folders and change hidden folders properties in your computer without using Folder Options then follow below step. 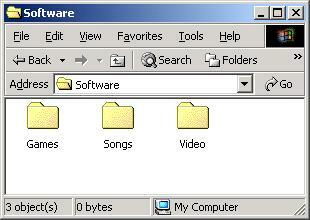 Say if you know have a hidden folder name is software in E: drive and do not show hidden files and folders options is active from folder options. So, software folder can't show in E drive. 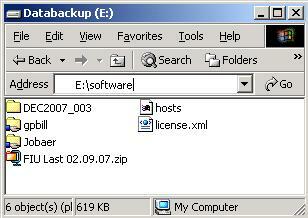 But if you type E:\Software in Address Bar then open software folder. Say, have three hidden folders Games, Songs, Video in software folder. If your need unhide above folders with software folder then right button click in software folder and select Properties. Now Tick withdraw from Hidden check box and click Apply. 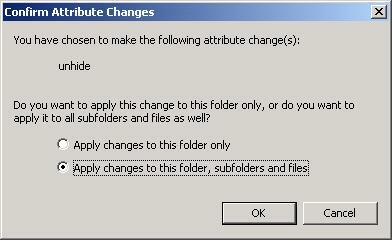 Now select Apply changes to this folder, subfolders and files radio button and click OK. Then again click OK in properties windows. Result: Games, Songs & Video folders unhide and display in Software folder. 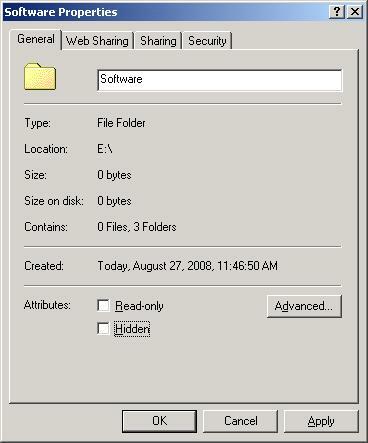 Software folder also unhide in E drive without using folder options.